GroundUp is an approach to research and service delivery which develops tools, methods, understandings and practices appropriate for the people, places and organisations with whom we work. Our researchers are from the Contemporary Indigenous Knowledge and Governance (CIKG) team at the Northern Institute, CDU. We have named our research approach ‘GroundUp’ because of our commitment to working collaboratively on the ground, taking seriously the knowledge and governance of both Aboriginal and non-Aboriginal people. As such, our research involves participating in the collective life of particular places, and doing so in collaboration with local researchers and consultants who belong to that place or organisation. We design and negotiate collaborations within and across in a variety of institutional settings, including traditional Indigenous institutions. 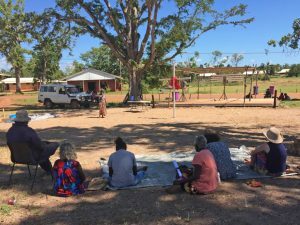 We work in urban and remote Aboriginal communities with government and nongovernment organisations to develop research and service delivery approaches suitable to diverse participants. Often this will include processes for careful reassessment of the categories and values assumed by academic researchers and funding bodies from the outset.